The American soldier John McAllister Schofield was born at Gerry, Chautauqua county, New York, on the 29th of September 1831. He graduated at West Point in 1853, served for two years in the artillery, was assistant professor of natural and experimental philosophy at West Point in 1855-1860, and while on leave (1860-1861) was professor of physics at Washington university, St. Louis. When the Civil War broke out, he became a major in a Missouri volunteer regiment and served as chief of staff to Major-General Nathaniel Lyon until the death of that officer. (In 1892 he received a Congressional Medal of Honor for "conspicuous gallantry at the battle of Wilson's Creek.") In 1861-1863 he performed various military duties in Missouri. In April 1863 he took command of a division in the Army of the Cumberland, and in 1864, as commander of the Army of the Ohio, he took part in the Atlanta campaign under Major-General William T. Sherman. 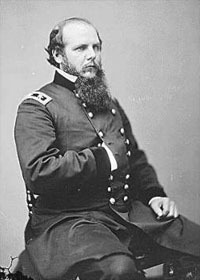 In October 1864 Schofield was sent to Tennessee to join Major-General George Henry Thomas in opposing General J. B. Hood, and on the 30th of November he fought with General Hood the desperate and indecisive battle of Franklin. Two weeks later he took part in Thomas's crowning victory at Nashville. For his services at Franklin he was awarded the rank of brigadier-general (November 1864) and the brevet rank of major-general (March 1865) in the regular army. Being ordered to cooperate with Sherman in North Carolina, Schofield moved his corps by rail and sea to Fort Fisher, North Carolina, in seventeen days, occupied Wilmington on the 22nd of February 1865, fought the action at Kinston on the 8-10th of March, and on the 23rd joined Sherman at Goldsboro. After the war he was sent on a special diplomatic mission to France, on account of the presence of French troops in Mexico; and from June 1868 to March 1869 he served as Secretary of War under President Andrew Johnson, after the retirement of Edwin M. Stanton. From 1876 to 1881 he was superintendent of the Military Academy at West Point, and from 1888 until his retirement in 1895 he was commanding general of the United States Army. He had become major-general in March 1869, and in February 1895 he was made lieutenant-general. He died at St. Augustine, Florida, on the 4th of March 1906.